We’d love your help. 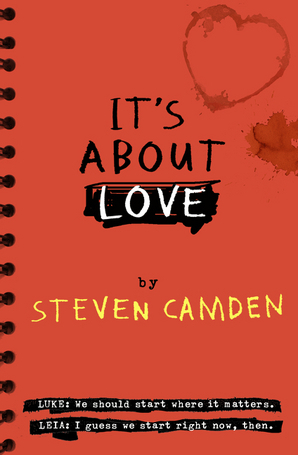 Let us know what’s wrong with this preview of It's About Love by Steven Camden. Only this isn't a film. This is real life. This is where monsters from the past come back to take rev Real life is messier than the movies. A bold, thought-provoking novel from the exceptionally talented, Steven Camden. To ask other readers questions about It's About Love, please sign up. I received an e-arc from Edelweiss, but this does not, in any way, have an impact on my review. More like a 2.5 stars, but a three. First of all, thank you to HarperCollins 260 for sending me an e-arc. I really appreciated it and squealed and squealed because it was my very first approved e-arc on Edelweiss (my account was just, an hour old? anyways.) Thank you so, so much. Yes, thank you, my brethren. Now on with the review. 1, Luke's kaartehan (Filipino term, guys. I received an e-arc from Edelweiss, but this does not, in any way, have an impact on my review. Luke always overreacts and I always hate that. He causes a scene when things are alright just the way they are. Like that scene when he just stormed out of the kitchen? Overreaction. And shouldn't he be happy that his brother .... ? I'd be even be happy if it was my nuthead brother who .... ! And his moody ways? Eh, not kool. 2. WHY THE BOOK IS SO LONG BUT YOU CAN ACTUALLY MAKE IT SHORT. It actually took me four days to finish this. And surprise guys: I didn't actually finish it. It was a 'dnf', because it got really boring at one point and not even sitting for four hours in the doctor's office would make me read this as a last resort. This doesn't actually conform to my reviewing standards, buttttt I promise I'll write a more coherent review in the near future (like long weekends). I have to say that based on the title and the cover, I would have never read this book. However, the girls in my student book club convinced me to read it and I really have to thank them - it’s great. This book oozes menace and tension and from the beginning, the reader is gripped by the fear of what has happened in the past and what that will bring to play in the present. This is a coming of age story that is difficult to label. The reader is warned about this complexity of plot and theme in cha I have to say that based on the title and the cover, I would have never read this book. However, the girls in my student book club convinced me to read it and I really have to thank them - it’s great. This book oozes menace and tension and from the beginning, the reader is gripped by the fear of what has happened in the past and what that will bring to play in the present. This is a coming of age story that is difficult to label. The reader is warned about this complexity of plot and theme in chapter 1 when, Luke the protagonist of the novel, debates the central premise of his favourite movie with a girl in his film class. “It’s a love story, you know ….. The fact that she’s even seen it make me like her, but it’s not a love story. The characterisation of Luke, the protagonist, is a strength of the novel. As a reader, you really like him but are often puzzled and devastated by his inability to articulate his feelings and his poor reactions to people and situations. Steven Camden has mastered the ability to bring the gritty reality of the tough neighbourhood of Bearwood, Birmingham where Luke lives into focus. Luke is a “fish out of water” when he starts at film school on the other side of town. At home, the return of his brother from prison is the catalyst for family and neighbourhood tensions that will climax on the night of Luke’s 17th birthday. The author also uses an interesting structural device in this novel by interspersing the story with fragments of hand-written notes describing snippets of memories, thoughts and dreams. Additionally, he also uses small inserts that read like film directions or play scripts. Together with countless references to modern films, this structural device compliments the central motif of film study. I highly recommend this book for YA readers who love gritty reality, love stories, character books and movies. 4.5 stars Proper loved this. Had me crying several times because it felt really honest and painful. I really loved It's About Love by Steven Camden. I had heard of the book when it was first published at the beginning of the year but I always felt a little bit on the fence about reading it. I knew it was about two characters, Luke and Leia, and that they meet on a film studies course at college, but nothing else apart from that. It wasn't until I attended YALC in July that I changed my mind. I he 4.5 stars Proper loved this. Had me crying several times because it felt really honest and painful. It wasn't until I attended YALC in July that I changed my mind. I heard the author, Steven Camden, do a performance poem about this novel and that made me really sit up and take notice. This piece of poetry was amazing and his delivery of it made me incredibly intrigued. So when I saw It's About Love on a library shelf recently, I snapped it up immediately. It isn't the first or last book that I've read because of YALC. And with It's About Love I'm really glad that I did give this book a chance. It is about two characters, Luke and Leia, and they do meet on a film studies course. That is true. But this novel felt like much more than that as well. It felt like a journey towards creating something wonderful and about identity and friendship and family and love and how all of those things can be messy and complicated and painful and beautiful. This book was filled with so many honest truths that I cried several times at the beauty of it. There was one particular bit about tears and how there are only two types of tears and reading it brought tears to my eyes so quickly that it took me really by surprise. I really loved the unusual format of the story. It's told from Luke's perspective and it has his narration, but there are also hand-written journal entries of his memories or thoughts or dreams. There are also some bits that read like a film script with scene headings and descriptions. It really worked and the whole film motif really worked throughout the story. I loved all the film mentions and particularly the creative process Luke and Leia writing their own screenplay for the film studies class. I loved the idea of Luke taking inspiration from his friends and family for ideas and how these little bits of conversation help shape both his writing but also his identity. I would like to thank Netgalley, HarperCollins UK and the author – Steven Camden for a free digital copy of this book in exchange for my honest opinion. The story is about Luke, he is going to college and meets Leia for the first time – yeah, Star Wars! He feels something in there, but he’s uncertain about what she thinks and feels. He is bouncing between his current college life, his current life with friends and his past life in the shade of his brother Marc, who is returning to his life after I would like to thank Netgalley, HarperCollins UK and the author – Steven Camden for a free digital copy of this book in exchange for my honest opinion. The story is about Luke, he is going to college and meets Leia for the first time – yeah, Star Wars! He feels something in there, but he’s uncertain about what she thinks and feels. He is bouncing between his current college life, his current life with friends and his past life in the shade of his brother Marc, who is returning to his life after two years of absence. I feel like this book is a must read for Rainbow Rowell fans, I can’t really put my finger on what is so similar about this book (it gives a similar feeling?) and, for example, Eleanor and Park, but I feel like they just have to read it. The language and setting is very, very British, be ready. This book touched me. I cannot tell, if liked the story or not, I stand somewhere in the middle as I wasn’t a fan of the actually story line, but it really left me with a lot of for for thoughts. And sometimes brought me back to my teenage years. Somehow it feels personal – Luke writes about real events, but perhaps it is actually Steven who writes about real things. I remember reading the book and wondering that it just doesn’t make sense – the red cover, the name of the book, it is just wrong, because the I felt like there’s more to see and feel about Marc than there’s about Leia, but then… at the end of the book, it fall into places, it was all about love. All because of love. This book was a real thinker for me. I knew I liked Steven Camden's work before I started it but wasn't entirely sure what to expect from this novel. I am glad to report that it was as good as I had hoped it would be and left me with loads to think about. I loved the way the story was told. It was a mix of traditional narrative and screen play notes which makes sense when you know the two main characters meet during their film studies class. The way in which it is told gives you a real chance to This book was a real thinker for me. I knew I liked Steven Camden's work before I started it but wasn't entirely sure what to expect from this novel. I am glad to report that it was as good as I had hoped it would be and left me with loads to think about. I loved the way the story was told. It was a mix of traditional narrative and screen play notes which makes sense when you know the two main characters meet during their film studies class. The way in which it is told gives you a real chance to get inside the head of the main character Luke and see what drives him to do what he does. For me he was a really interesting character caught between where he came from and his past experiences whilst striving to be his own person and make something of himself on his own without relying on his family connections or thuggish mates. First, I have a gripe with this book, it doesn't really matter overall, but it annoyed me. Here it is: WHY LUKE AND LEIA???? Why!? They're brother and sister in Star Wars, dang it! Yes, there's that confusing scene where they kiss, but they're brother and sister! Let me be clear, the characters in this book do point that out, it's not as if the author completely ignored it, but it still annoys me. Mostly because this isn't the first time I've seen it and it's just a pet peeve. On to the real review! It's About Love follows Luke, a seventeen-year-old film student who wants nothing more than be a scriptwriter and make his own movie. Luke has a..completcated past involving a brother, Marc, in prison and a scar across his face. There was a lot going on in this book. I loved all the side plots, with Luke's parents who are separated, Leia's brother who has a history not unlike Luke's, Luke's brother who's about to get out of prison. They were all done so well. Then you have the main plot, you have Luke and Leia's romance, Luke's history, the screenplay they're writing together, and their awesome film teacher. Basically, this isn't your normal love story, there's so many little things going on, some much painful history and it's so well written! This book is about love - many different forms of it - but it's also about everything else. This is where things took a turn for the worst for me. I didn't find myself drawn to really any of the main characters. So, Luke and Leia, I didn't like either, though I preferred Luke to Leia. There was just so much drama with them. Luke kind of flipped flopped and wasn't very likable, pushing away his friends and family. Leia was dramatic, and not in the book nearly enough. The side characters, though! I loved them. I connected with them, I felt for them. Not for Luke and Leia. I loved Marc(Luke's brother) most of all, but also Luke's best friends and I wanted more of all of them. Less Luke and Leia. The thing is, the "message", It's About Love and all that, kind of fell flat. The whole end did. The romance just wasn't...romance-y enough. I didn't really like Leia, she was too "the perfect girl" and kind of moody, if you ask me. I never really understood what they saw in each other which ruins romance for me and by default, the whole "It's About Love" point of the story. There were twists though! What with Luke's brother, who just got out of prison for something that involved Luke(no spoilers here! ), and the backstory wasn't something you see a lot, which I loved. I loved the side characters, I loved the family dynamics, and how that all ended. It was perfect. The romance is what really made the book drop in my opinion. SO MUCH DRAMA. Luke doesn't want to like Leia at first, then they kind of do, then things happen and she won't talk to him. Which, I understood, a smidge, but really? It felt like she was overacting. And the end fell short because of it. I mean, why was Luke even trying so hard to get her back, she wasn't that great! Overall: This was a good read, I fell for the writing and side characters. Unfortunately, I didn't fall for the main characters which impeded my enjoyment of this one. Would I Recommend This? Sure. To Whom? People who love a good story but don't need compelling romance and characters in contemporary. I've said this time and time again but there is something some raw and real about novels from the UK, or written about the UK. It's just something in them, this grittiness--that says I don't care what is appropriate or normal to you. I'll write what I want. I'll write my reality and I don't care if you can't put it into a mold. It's About Love pretty much does that. It's not overly romantic even though it is about love. It's not overly anything. It's just this story that you read and you either I've said this time and time again but there is something some raw and real about novels from the UK, or written about the UK. It's just something in them, this grittiness--that says I don't care what is appropriate or normal to you. I'll write what I want. I'll write my reality and I don't care if you can't put it into a mold. It's About Love pretty much does that. It's not overly romantic even though it is about love. It's not overly anything. It's just this story that you read and you either like it or you don't--you either connect with it or you don't. I don't feel like there's room for in between with this novel. This novel tells the story of Luke and Leia. Luke is a kid in college, first in his family I believe. He loves film, and is taking up film classes where he meets Leia. Who not only matches his name through a shared parental love of Star Wars--but they connect on levels he's never imagined. He's not the kind of kid that's looking for love, it just kind of finds him. It consumes him but not in an overly dramatic, or sweet way. It just kind of works. But of course, nothing is simple about any of it. The charaters: Luke is interesting. He's not overly emotional although he has a lot of emotions pent up inside of him. He's big and burly but boyish from inside out. He's kind of complex without trying. His friends are what you'd imagine, total opposites, but loyal. Leia, I don't feel like there's much to say about her. You meet her, and you learn about her but not much. She's kind of this mystery but not. If that makes sense. You get to learn a bit about her but not very much where you feel like you know all about her. Marc, Luke's brother. He was a very intriguing character, his presence was so strong on Luke--but I won't say much else about him. It feels sort of spoiler-y to go into his background. Luke's parents, I could literally see them in my mind's eye. I feel like I know exactly how they look and how they act. I liked them. I liked their part, albeit small, in the story. The plot: I'm not entirely sure what the point was but I feel like I got it. I'm not sure where were supposed to reach some predestined conclusion. I think it was just about love and how it affects your life, whether it be romantically or not. I think if that was the point, then it was made. Overall, I enjoyed the book. It's not a book you should expect to blow you away or have you flying through the pages. It's one you read slowly like watching a film. Like I said, you either love it or you hate it. It's that simple. I was lucky enough to love it more than hate it. I'd recommend it for contemporary lovers who don't have a problem with a lighter romantic story line, and a heavier reality one--one more focused on the characters life, and not who they're hooking up with. I received an Advance Reader Copy from the publisher via Maximum Pop. This in no way impacted on my view. This book was something different, and it's proving hard to rate. I think it's a 3 star read, as I quite enjoyed it, but at the same time didn't, if you know what I mean? It's About Love follows the life of Luke Henry, a 16 year old coming to terms with his brother's return after two years in prison, a new college, and balancing his old friends with his new. Luke struggled with his anger a lo I received an Advance Reader Copy from the publisher via Maximum Pop. This in no way impacted on my view. This book was something different, and it's proving hard to rate. I think it's a 3 star read, as I quite enjoyed it, but at the same time didn't, if you know what I mean? It's About Love follows the life of Luke Henry, a 16 year old coming to terms with his brother's return after two years in prison, a new college, and balancing his old friends with his new. Luke struggled with his anger a lot during this book, and that aspect of the novel was something I'm not sure how I felt about. Luke and Leia, the main characters, were quite enjoyable, especially together. Leia was different and quirky, but not in an over the top way. Both were hiding facts about themselves from each other, mainly about their brothers, and I liked the way they worked through their college assignment by giving little hints into their own lives. To return to Luke's anger, I felt as though anger was one of the main themes of the book. His brother, Marc, went to prison for ABH (Actual Bodily Harm), he, himself, was the victim of violence, and then he attacks someone else later on in the book. I know this was used to show not everything is perfect, and that there is a gritty underbelly of British society that tends to be overlooked in UKYA. Perhaps it was because it's not often mentioned that I found it a bit abrupt, but it was sort of enjoyable to read about at the same time, if enjoyable is the right word. One aspect of the book I really enjoyed was how it was split between typed text, handwritten text, and screen directions. These different looks split the action between past and present, and personal thoughts. I definitely changed the pace of the story, and for the better. Rather than learning about what actually happened with Marc, and with Luke's scar in one big chuck of text, it was interspersed throughout the entire story, making you learn just enough to keep you aching for more. It’s About Love is not a typical love story. The author of Tape, Steven Camden, has written a story from the point of view of a sixteen-year-old boy named Luke. In his first week of college he meets a girl in his film studies class. Her name is Leia and, ignoring the Star Wars connection, their passion for film makes them the perfect partners. Luke, however, comes from a very troubling background. He has purposefully chosen a college two bus journeys away in order to escape his past. He can try to hide his relation to his brother due to be released from prison, but he cannot cover up the scar on his face. Initially Luke wants as little attention as possible, although once he starts developing feelings for Leia he enjoys being around her and her friends. Yet everything changes when Luke’s past life and friends collide with the new. Believing he has ruined everything with Leia, Luke needs all the encouragement he can get from his film studies tutor, Noah, to keep on going. Camden writes the story through first person narrative, film directions and ideas in Luke’s notebooks. This is an interesting method and helps to create a clearer picture of Luke’s personality. He is a teenager with potential and the ability to think for himself. It is his past history that makes him feel like he does not deserve happiness or success. Although I liked the concept I did not care for any of the characters. Many could be described as thuggish and a lot of violence was involved. I understand that Luke needed to be involved with these types of people for the storyline to work, but it was not for me. Despite the title, It’s About Love is more suitable for young adult males than it is females due to the nature of the story and the main character. Whether a boy would happily be caught reading a book with ‘love’ written on the cover is another matter. Steven Camden clearly has the young adult audience in mind as he writes and, even though I did not think it anything special, I am sure there will be many readers who will love this book. This is the first book I've read by Steven Camden, and it certainly won't be the last, judging on the quality of the writing in It's About Love. It is a love story, but it's also so much more than that. Like many YA books, it doesn't fit neatly into a pigeon hole. Yes, it's about love, but it's also about family, friends, growth, and generally being a teenager with secrets and angst and terror and wonder. I confess, I had a mini cry in this book, but not in a place I expected. What affected me wa This is the first book I've read by Steven Camden, and it certainly won't be the last, judging on the quality of the writing in It's About Love. It is a love story, but it's also so much more than that. Like many YA books, it doesn't fit neatly into a pigeon hole. Yes, it's about love, but it's also about family, friends, growth, and generally being a teenager with secrets and angst and terror and wonder. I confess, I had a mini cry in this book, but not in a place I expected. What affected me was a moment of pure joy and happiness, that made me well up and feel as emotional as the characters. It's rare that a book can do that. The characters have strong voices. Luke speaks to us not only in first person throughout the book, but we also hear his thoughts, which I love as it helps to add depth to the character. I did find the whole Luke / Leia / Star Wars thing a bit cheesy, but also quite sweet, and it added to the sense of destiny that the author is trying to convey. Strong characters, secrets to discover and so much life hide between the covers of this book. Overall, I would highly recommend it. I picked up this book because I read Tape, Camden's last book, and it ended up reminding both of what I liked and disliked about Tape. When I first picked up It's About Love, the book struck me as melodramatic. Luke, the novel's protagonist, seemed unrealistically emotional about minor events. I also found bits of the story throughout to be cliché while pretending to be above clichés. These were traits I noticed in Tape as well, and they were unfortunately present in many parts of the book. Howev I picked up this book because I read Tape, Camden's last book, and it ended up reminding both of what I liked and disliked about Tape. When I first picked up It's About Love, the book struck me as melodramatic. Luke, the novel's protagonist, seemed unrealistically emotional about minor events. I also found bits of the story throughout to be cliché while pretending to be above clichés. These were traits I noticed in Tape as well, and they were unfortunately present in many parts of the book. However, I quickly realized that It's About Love is not about petty drama blown out of proportion. The events of the story carried real emotional weight, and, like the best YA, the book gives teens and adults equal complexity. Despite the angst I disliked at the start of the book, teens were not written as irrationally emotional (or at least not more so than any human). Adults were not written as scolds or kept out of the story. Instead, the novel provides a nice balance of the many forces which make up a real person's life: family, community, school, friendship, and self-discovery. As the story went on, I also noticed the clichés less and less because I was drawn in by the story and the characters. Yes, there are certainly stock characters present throughout the book, but Camden managed to make his central characters feel effortlessly rounded and real. Even if it isn't always subtle, I appreciated the book showing instead of telling the reader. By the end, I found myself right alongside the characters through their ups and downs. Perhaps the writing wasn't always elegant, but as I got closer to the end of the book I didn't care; I was fully involved with the people and places that the book had slowly brought me close to. Luke and Leia both have Dads who are massive Star Wars fans. They are in the same film studies course. They work on a project together and their ideas fit perfectly. It's like they're meant for each other. It's like in the movies. Only it isn't. It's real life, and sometimes, the past gets in the way. I received a copy of this from a very awesome book blogger friend after meeting Mr Camden at an author event last year and talking to her at length about him and his first novel, Tape. I really enjoyed the way this book flowed. Reading almost like a screenplay, the main character's story slowly unfolded, teasing early on then answering questions the earlier chapters raised towards the middle, this book is definitely an interesting read. Despite being written from the perspective of a somewhat ty I received a copy of this from a very awesome book blogger friend after meeting Mr Camden at an author event last year and talking to her at length about him and his first novel, Tape. It was one of those "read because I had nothing else to do" reads. So I had no expectation how it would turn out and it turned out okay. Story was simple, characters were okay and some of the one-liners were quote worthy. I love love looooved this book!!! I loved it. I loved the characters and the backstory and just the way the main character Luke's train of thought was like a movie/script. I want more from this author, he is fantastic. Amazing. A little cheesy if you're not into contemporary, but amazing. It was so perfect, the way the plot was built and the story it was a magical combination of beautiful words and a strong plot. Different from the cliché romance novels. A book about two people who love movies more than anything. "He's Luke. She's Leia. Just like in Star Wars. Just like they're made for each other." Steven Camden has written this entire book so well, that every line to me sounded like the best quote ever. Am de Amazing. A little cheesy if you're not into contemporary, but amazing. It was so perfect, the way the plot was built and the story it was a magical combination of beautiful words and a strong plot. Steven Camden has written this entire book so well, that every line to me sounded like the best quote ever. Am definitely not exaggerating but not everyone would share the same opinion as me. A book about love, when I received this I did not expect anything more than a normal college romance. But it was so much more in every way. I partially enjoyed it so much, because of the fact that it revolved around the love for movies and well, I absolutely love movies. The story was uniquely written as a script and I loved that. This is the second book I've read of Steven Camden and I completely am in awe of his writing. Two people bonded over their common interest of films. Friendship turned to love. But that wasn't the only thing in the book. It spoke about family, beginings, revenge and love. The bond of brothers. The difference between right and wrong. About exploring, understanding and a fresh start. Character development was good. Plot and story was excellent. Writing was the best. I ended up liking this book lot more than I had expected. And I feel like I enjoyed this a little extra because i had only been reading very straight and non-contemporary books, that this one turned it around for me. I do enjoy non-YA books but sometimes I just gotta have that little change. Not saying that this book was perfect, because nothing ever is. The starting was a bit difficult for me to grasp because of the different way of writing, but soon I got the hang of it and enjoyed it. The start was a bit monotonous too, but the plot soon had unexpected twists that kept me hooked. On the whole a beautiful book and I would personally reccomend this to everyone. If you think after reading the title that its some boring love story, well no its not. Its lovely. A huge thanks to the publishers for a review copy. Je n’ai pas accroché à l’univers et à la plume de l’auteur. La narration m’a déstabilisé et je n’ai pas accroché tout au long du roman. J’ai faillis une fois de plus, reposer le roman. J’ai pourtant essayé de lui laisser une chance mais rien à faire, le roman n’est pas fait pour moi. La référence m’a fait sourire avec “Luke et Leia” mais cela s’est arrêté là pour les personnages. Au début, je ressentais beaucoup d’empathie pour Luke. C’est un garçon plein de colère, qui se cherche finalement. Mai Je n’ai pas accroché à l’univers et à la plume de l’auteur. La narration m’a déstabilisé et je n’ai pas accroché tout au long du roman. J’ai faillis une fois de plus, reposer le roman. J’ai pourtant essayé de lui laisser une chance mais rien à faire, le roman n’est pas fait pour moi. La référence m’a fait sourire avec “Luke et Leia” mais cela s’est arrêté là pour les personnages. Au début, je ressentais beaucoup d’empathie pour Luke. C’est un garçon plein de colère, qui se cherche finalement. Mais au fur et à mesure des pages, je l’ai trouvé assez lourd, très violent et la narration ne l’a pas rendu très agréable finalement. Dommage donc. Néanmoins, comme je vous le disais, cela n’a rien à voir avec la qualité de l’ouvrage car je pense que ce personnage peut paraître plaisant à d’autres et sera mieux compris que par moi-même. La plume de l’auteur m’a tellement dérangé que les rebondissements ne m’ont pas suffit. Certaines pages m’ont parus plus longues que d’autres et même si la fin a quelque chose de surprenant, mon ressenti est resté le même. “There are only two types of crying. Think what you want. I don’t know you, or where you’re from, but where we’re from, there’s two kinds of tears. There’s the tears that come for someone else. Tears you cry because you’re watching something bad happen to somebody you love, or something coming to an end. Those tears come quickly. They start right at the moment - usually a goodbye, for a while or forever - and they belong to whoever’s leaving. They are the feeling that colours the picture that person gets to take with them. That ones kind. The other kind are the ones that come for yourself. They take longer. Tears that come when a moment cracks the fam of you, who you are, the wall that you’ve built and kept up since you can remember and when that wall cracks, and the pressure’s released, the tears that come carry everything. Every mistake. Every promise. Every lie. Every cold shoulder. Every bite. Every tiny death that you’ve ever felt floods out, over you. Through you. The tidal wave crashes and the edges blur as you fall to the floor, feeling the power of what you’ve started and can’t control. I think I really liked the concept of the novel, but I think it could've been executed better. I liked the contrast between life in a film, and life in the present. It put things into perspective and really let you see how movies are never really like real life. I enjoyed the fact that Steven Camden kept alluding to the idea that life is never a film, and it's not all sunshine and rainbows, and it's things like this that we don't see in the movies. I liked the level of insight we got into each ch I think I really liked the concept of the novel, but I think it could've been executed better. I liked the contrast between life in a film, and life in the present. It put things into perspective and really let you see how movies are never really like real life. I enjoyed the fact that Steven Camden kept alluding to the idea that life is never a film, and it's not all sunshine and rainbows, and it's things like this that we don't see in the movies. I liked the level of insight we got into each character, to enable us to understand each of their motives. I would've given this book more stars, but for me to do that I need to be able to connect to the characters and relate to them, to ensure that the story speaks to me, and it just didn't. I enjoyed the ending how Leia and Luke connect, it made sense, and it was a nice way to end such a bittersweet novel. Luke meets Leia in his media class where teacher Noah, was once in a film he wrote himself. As Luke and Leia work together, their world's collide as Luke's brother Marc gets released from prison after he caused ABH, Like finds himself questioning whom he truly is after a few brushes with fights himself and discovering why Leia suddenly goes quiet on him after they'd been getting along so well. It was quite slow in places but the drama about violence and aggressive behaviour from siblings was int Luke meets Leia in his media class where teacher Noah, was once in a film he wrote himself. As Luke and Leia work together, their world's collide as Luke's brother Marc gets released from prison after he caused ABH, Like finds himself questioning whom he truly is after a few brushes with fights himself and discovering why Leia suddenly goes quiet on him after they'd been getting along so well. J’ai esperé aimer ce livre, j’ai voulu l’aimer, mais malheureusement je suis un peu déçue par cette lecture. J’ai eu beaucoup de mal à rentrer et donc accrocher à la façon dont s’est rédigé : on est plongé dans la tête et les pensées de Luke, et j’étais complètement perdue au début avec lui (si c’était l’effet voulu, alors c’est gagné !). Pour autant, j’ai été touché par certains passages, je me suis reconnue dans certaines situations, j’ai apprécié les dernières pages et le joli message de fin. Ma J’ai esperé aimer ce livre, j’ai voulu l’aimer, mais malheureusement je suis un peu déçue par cette lecture. Mais je reste mitigée, sûrement car l’histoire m’a trop rappelé celle de Eleanor & Park (de Rainbow Rowell), que je n’avais pas aimé, meme si cette fois c’est du point de vue d’un garçon que les choses se passent. Best book I've read in a long time. It's real, raw and true - the emotions and characters are portrayed beautifully throughout. The book deals with the real life issues and problems and doesn't sugar coat them. Definitely one of my favourites. The references to Eminem, Blackpool and Star Wars had me smiling throughout. Steven Camden is one of the most acclaimed spoken-word artists in the country. As Polarbear, he has performed extensively around the UK and internationally. He also writes plays, teaches storytelling in schools, and was a lead artist for Ministry of Stories and The Roundhouse poetry collective.